After the mild New Year, this winter has, as I hoped, returned to true winter conditions. 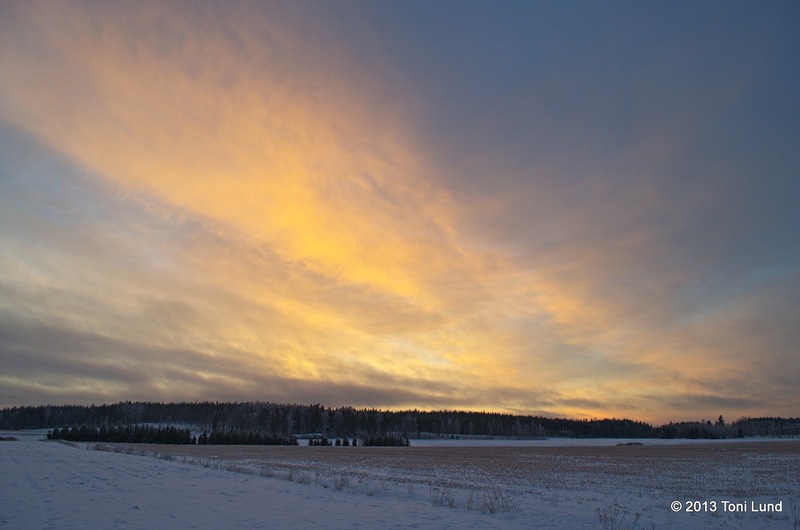 The temperatures have stayed safely below freezing and were forecasted to plunge in the -20°C range in the weekend. Not only it was getting colder, but we got 10cm of new snow. Things looked absolutely great for the weekend and more training for the Rovaniemi 150. At the same time, Peter was in contact with me again with a great plan. He was going to take Friday off from work and head to the bogs of Kurjenrahka. At first I was a little hesitant to take another day off from work, but as the weather forecast was getting better and better, and knowing that Kurjenrahka is an amazing winter paradise, offering excellent conditions for training, I was in. The timing of pretty much everything was perfect for the trip, because I also received a new custom outer bag from Brenig on Thursday. Although my Marmot Never Summer sleeping bag is rated at -18°C, and works down to -20°C, meaning it would be enough for the forecasted nights, I wanted to test how much the outer bag would give extra warmth. I started riding towards Kurjenrahka a little late from my home. It was -17°C. My route was same as in the Vajosuo Beer Ride, but back then I actually missed one shortcut fairly close to my home. It's Askala, where the route crosses the River of Paimio. There is also an old hydropower plant. I have never been there before. When I arrived there in the dark, I was stunned. The place felt like from a sci-fi movie with a long passage tunnel. Another nice surprise was that the small road was unplowed. The area is really hilly, so I ended up to some bike pushing as well. After Askala I stopped to increase the tire pressure because my going felt awfully slow. Also, as I progressed towards Vajosuo, the coldness felt slightly gruesome. Over three hours of frigid riding and at midnight I finally arrived at the Vajosuo forest road. Peter had arrived almost two hours earlier and he had already a campfire on. Originally my plan was to be there first and start the fire, but my late start and slow going changed that. A campfire makes things much easier on cold trips like this. It doesn't give any warmth to the shelter but it's really essential to warm fingers. We grilled some icy sandwhiches which tasted great. I also prepared my sleeping system right away. 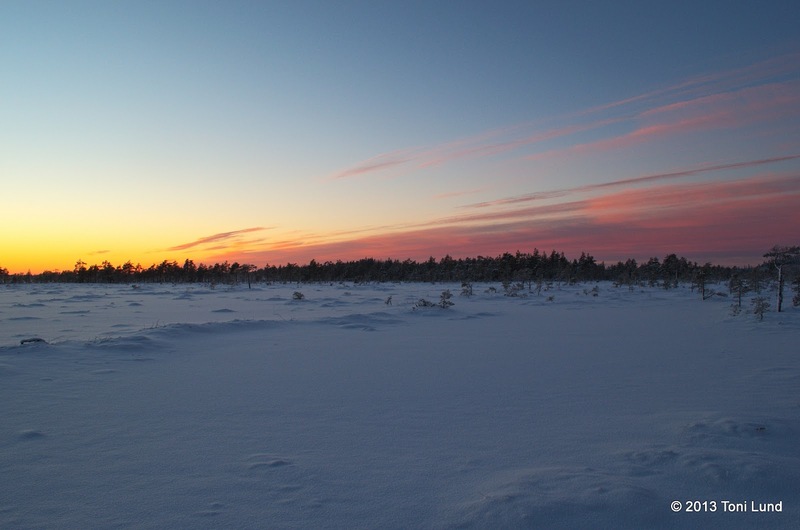 The night was colder than forecasted, around -23...-25°C. I did two mistakes here. I closed the drawstring around my neck properly, but not the other one around my head and the one on the Brenig outer bag. Secondly, I didn't take my foam sleeping pad (Multimat Extreme XL) with me. So, it felt at times slightly cold and uncomfortable. Peter was the firemaster again in the morning. 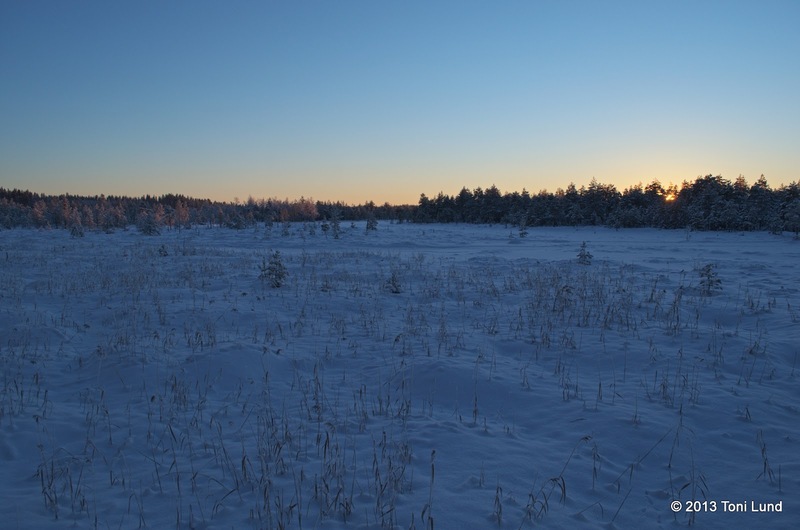 I was a little slow with my morning chores and packing, so Peter started riding around the Vajosuo bog to keep himself warm, and take photos of the sunrise. Fairly soon I was there too. The morning was fantastic! The new snow was rideable, but it was fairly hard work, and some places had to be pushed, as Peter demonstrates. Peter has done a couple of snow crust trips here before, so he knows the areas very well. But our shortcut to next place didn't go as planned, and we ended doing a plenty of bikepushing and bushwhacking. It was actually a pleasure, because it was so, so beautiful in the woods! The slower speed with walking kept toes warm. Next we tried to enter the Laidassuo bog, with another forest section with bikepushing, but our going was slow. We decided to turn back and have a lunch break. On the return I had one scary moment. There are still some unfrozen spots on the bogs and my left foot went down to one of them. But no worries, the 45North Wölvhammer boots are "bogproof". My feet were warm almost all the time. I wore one pair of long socks, a pair of merino wool socks and thick handknitted wool socks. Our restaurant view couldn't be much better! The kitchen. I didn't have time to practise the new stove with gasoline fuel prior to trip, so I had a small gas canister. It was enough for the outdoor meal, but it ended when I was melting snow for drinking water. Peter's canister ended later as well, so we had to rely on campfire onwards. 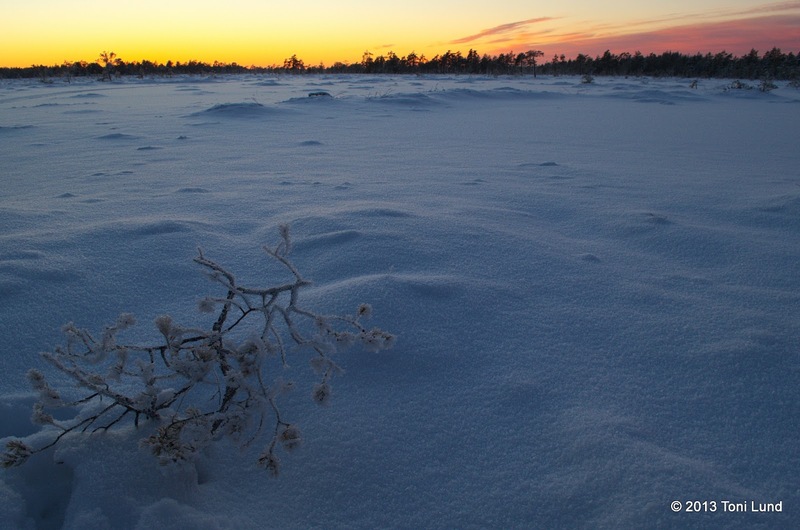 The temperature was around -17°C, and it didn't feel too cold. After lunch break we headed to Kurjenrahka bog via a short road section. 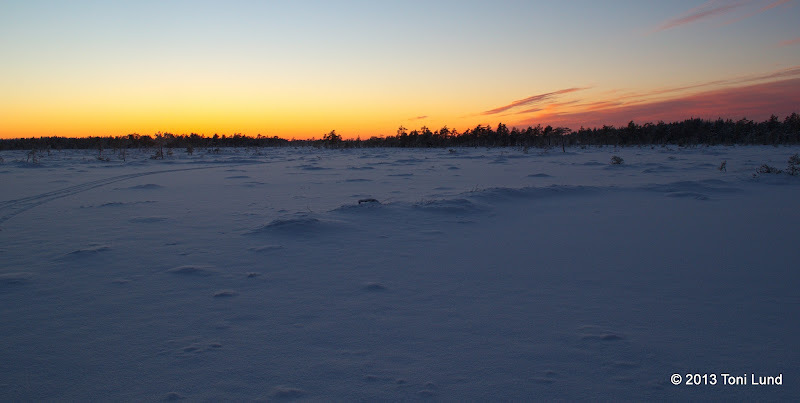 It's the largest of the bogs in the National Park of Kurjenrahka, and we were there on the televised fatbike trip for Erätulilla program last year. Perfect timing again, as the sun was setting. 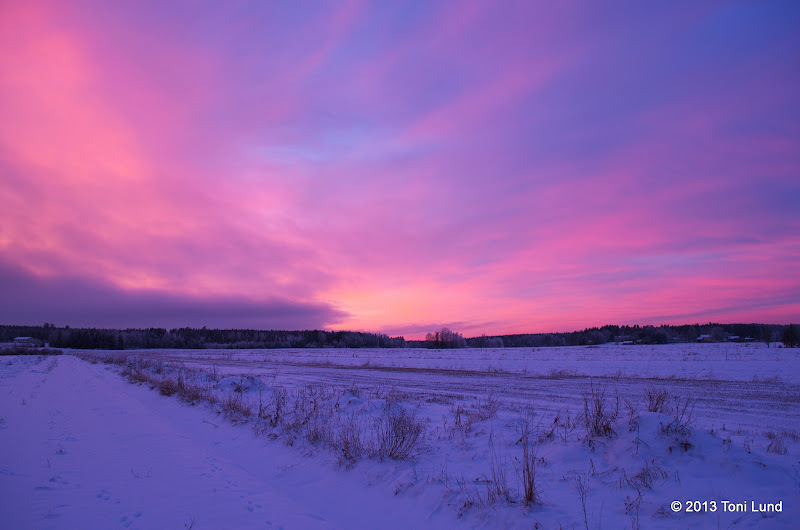 The sunset painted the sky in beautiful purple tones in the north. 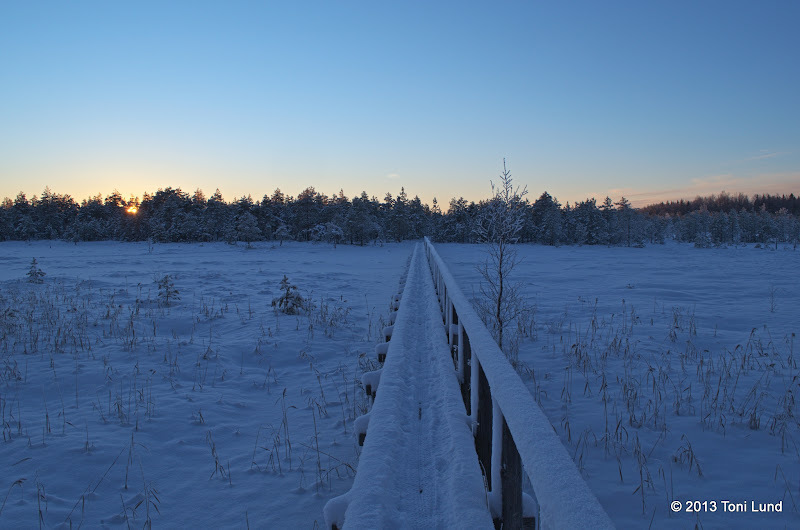 The narrow bridge over the bog. Yes, I rode it, all the way. Words are not enough to describe how magnificent this place is. Hopefully our photos are. 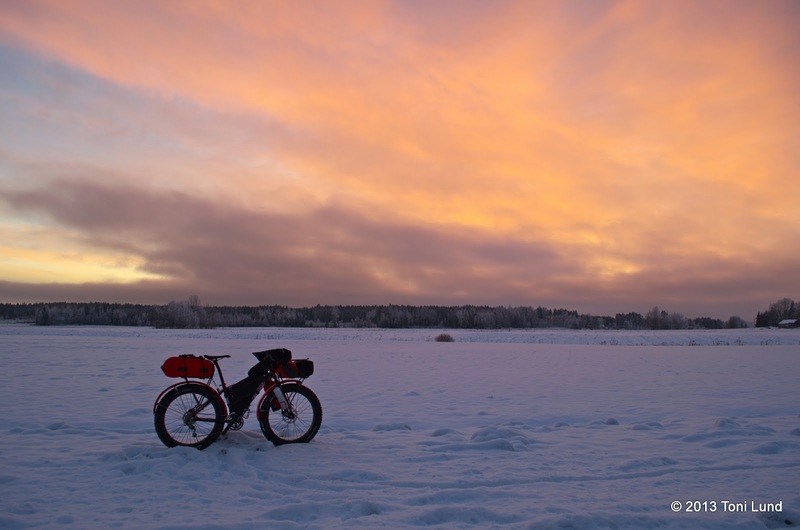 After near-perfect joy of fatbike riding across the Kurjenrahka bog, we arrived at the Töykkälä shelter. It was getting even colder than on Thursday night. The shelters are really great here, with plenty of firewood. There was also a mat on the floor and several small foam pads for sitting. A good thing for the cold night. We prepared our food, warmed fingers and we were ready to go to sleep a lot earlier. I checked the latest weather forecast with my smartphone. 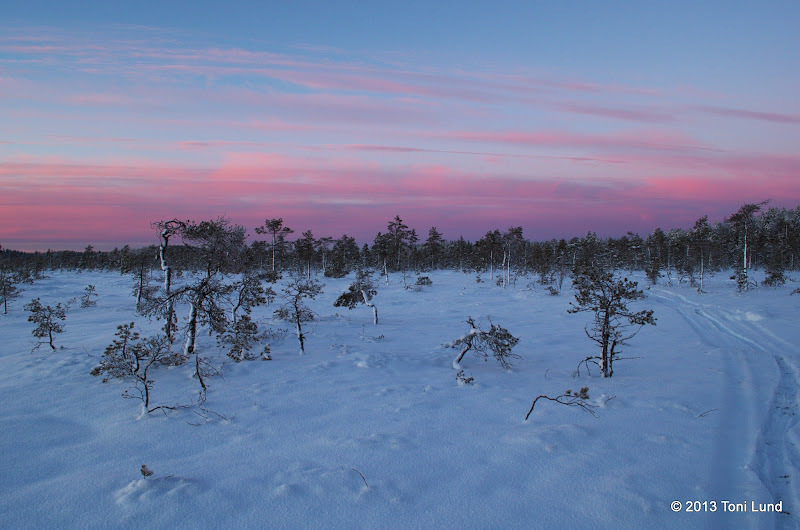 The night temperature could drop to -28°C! I really wanted to be warm in the sleeping bag, so I wore my down pants and closed all the drawnstrings properly. And yes, this time it was really warm. Only my feet felt slightly cold but on the upper body I could have undressed one layer off. The Brenig bag was really as good as promised! My StemCAPtain thermometer was at the bottom. The night temperature could have been close to -30°C. I ate an outdoor meal again for a breakfast. Peter packing his bike. Peter started riding home earlier as he was running out of time. I enjoyed the morning with the last cup of coffee. My setup for the trip. The trail to the forest road had lots of snow covered weak trees hanging in the way. On the forest road. Just beautiful. I rode via the same route as on Thursday evening. To my surprise, riding felt a lot better than on Thursday. Not necessarily a surprise because the views were a constant blow of beauty. Entering the unplowed section to Askala. The Askala Power Plant. Stunning. For a perfect ending, the sun and sky was creating art again. After all this, what else can I say that this was an awesome trip! As I arrived at home, I didn't even feel tired. I could have continued riding who knows how long. This trip also demonstrated that we can handle very cold conditions, although I have to admit that I'm getting closer to the limits. Thanks to Peter again for the company. Read his story and enjoy his great photos here.